New School Visit | Simple. I Just Do. Today, The Boy and I go to visit his new school in the afternoon. I am picking him up for lunch so that he doesn’t have to go to social studies. We’ll have a special McDonald’s lunch and then head to the new school to see where his classes will be and meet some of his new teachers. The Boy is extremely excited, and asks for a daily report about how long it will be before he goes to his new school. We got the phone call today from the company providing his transportation, as they thought he was starting tomorrow. I told them they could wait another week, but The Boy was excited to learn that he will be transported to and from school in a gold-colored Town and Country van. It will be a long trip for him, but he has missed riding this bus all these years, and was always so envious of his buddies who were “bussed” in from other districts at his old school, often in charter company cars like he will now be using. I think he will love it. I hope he can contain himself at his current school for one more week. 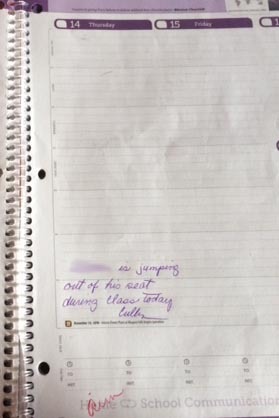 We got a note home from his social studies teacher on Thursday that he was “jumping out of his seat” during class, and I immediately thought, “because he’s happy he only has one more week in your class, lady!” I didn’t bother to respond. My excitement is tempered with a bit of anxiety, as any mother’s would be. But I take heart in the fact that those who know him best on this planet agree with me that this will be a good switch for him, and that he can handle it. Judging by his excitement, I’m fairly certain he will prove us correct.